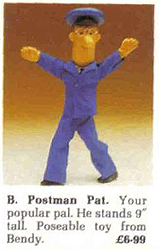 Bendy Toys Ltd made a version of Postman Pat in their characteristic bendable foam rubber. 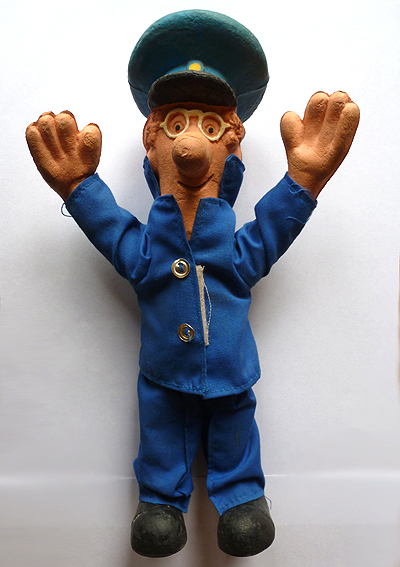 This toy dates from the early 80’s and is one of the first Postman Pat toys. In mint condition it is increasingly rare. These toys came boxed with a cellophane cover and the finish was hand painted. The rubber exterior covered an inner wire armature. Bendy made a whole range of other character figures – “Lovable World Wide TV and Film Favourites” as they said on the box. 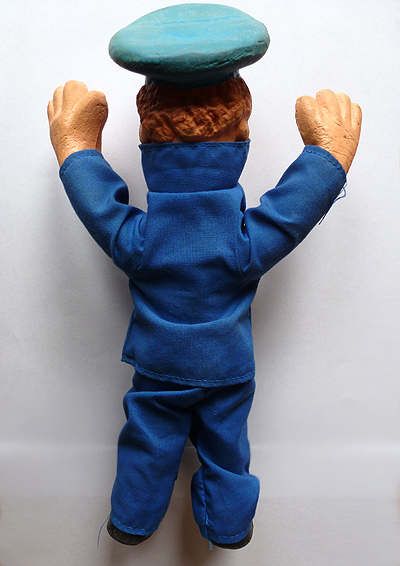 The Bendy Postman Pat stands 9″ tall. Original examples have a removeable blue fabric jacket and trousers. The jacket has a velcro fastener. A major problem with finding a mint example is that over time the rubber in the Bendy toys begins to perish; it hardens and crumbles.